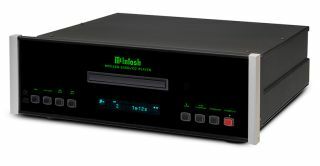 McIntosh announces MA8900 amp and MCD350 CD player | What Hi-Fi? These devices feature new technology - including McIntosh's Monogrammed Heatsinks - in the search for better sound. The High End show in Munich is in full swing, with McIntosh unveiling two impressive new products: the MA8900 amplifier and MCD350 CD/SACD player. The 200 watts-per-channel MA8900 is the first to feature McIntosh Monogrammed Heatsinks, which are supposedly super-efficient at heat dissipation. As well as giving the unit an industrial look, they connect to advanced high-current output transistors to eliminate thermal equilibrium lag time. There's also new, more powerfu,l microprocessors and new components to improve operation. All the digital inputs are housed in the new DA1 Digital Audio Module. This is upgradeable and can even be replaced by future modules - so your system will never go out of date. The DA1 has an upgraded 8-channel, 32-bit DAC with six digital inputs. The USB input accepts signals up to 32-bit/384kHz and supports up to DSD256 and DXD 384kHz. On the analogue side, you've one balanced and six unbalanced inputs, plus both a moving coil and moving magnet phono stage for connecting a turntable. Each input can be renamed, to make things easier still. Now, the MCD350 CD player. This features a balanced, two-channel, 32-bit/192kHz DAC, with fixed analogue stereo outputs in both balanced and unbalanced varieties. There's also a coax and optical output onboard. Two-times read-speed means discs are read faster, and their data stored in a buffer memory for better error-correction and tracking. Both devices are available to order now, and are expected to ship in June. The MA8900 costs $7,500 and the MCD350 $4,500. UK pricing is yet to be announced.